Directed by Chandler Tuttle. 2009. The year was 2081 and everyone was finally equal. They weren't only equal before God and the law, you see, they were equal every which way. Nobody was smarter than anybody else, nobody was better looking than anybody else, nobody was stronger or quicker than anybody else. And all this equality was due to the 211th, 212th, and 213th Amendments to the Constitution. And to the unceasing vigilance of the United States Handicapper General. The strong wore weights to make them weaker, the intelligent wore earpieces that kept them from taking unfair advantage of their brains. Even the beautiful sometimes wore masks in situations where their beauty might simply be too distracting. It was the golden age of equality. Such is the state of equality in 2081, Chandler Tuttle's directorial debut based on Kurt Vonnegut Jr.'s short story Harrison Bergeron. Though clocking in at only 25 minutes the film makes quite an impact depicting a citizen defying a society in which equality is imposed by governmental force. The situation might sound preposterous but the program's inception, suggested only visually, is surprisingly plausible: we see the Handicapper General making a political speech and behind her are people holding signs for "Equality." Like today or in recent history when such a sign at a similar event might read "x for y" with the name of the interest-group (x) and issue (y) of the hour, these signs are simply for "equality." Never mind the ideas behind the issue or its morality or legality. They demand equality now. There is a certain frightening plausibility to that situation, not that people would end up forcibly handicapped, but how many could be persuaded of the idea's soundness in the first place and that they themselves, or someone in their name, could take the authority to enforce the idea on the unwilling. There is also something unmistakably progressive about the situation. "Final (or Finally) Equality" the sign reads, with the implication that now, now we've finally progressed to such an enlightened state where everyone is. Now we have made everyone what they should be. The weight of one document that stood as a bulwark against such overreaching, the Constitution, evaporates at the phrase "213th Amendment." This mention of the Constitution fails to console but not because it is old or out of date, rather because it too seems weighted down under hundreds of emendations, exceptions, and inclusions. Yet even in 2081 the world had not quite progressed enough for some as, "Some things about living were still not quite right, though. April, for instance, continued to drive people crazy by not quite being springtime." If only someone could fix that. That the director was able to suggest all of this with one phrase and the above shot exemplifies how the film remains full and effective despite its brevity. The characterizations of the Bergerons are likewise effective and economical. George, clearly a man strong of mind and body since he wears both weights and noise-generating headphones, contrasts sharply, even pitifully, with his simpleton wife. When discussing the latest outburst of his head device, she idly says how if she were Hanidcapper General she would make the noises chimes on Sunday, "just chimes, kind of in honor of religion." She says it as people often do when out of idleness they wax, "You know what would be nice?. . ." She is earnest but she really has not thought about the issue. Again, though, there is a frightening plausibility to what she says: Imagine if someone who had not really though his ideas through, in terms of legality, logical consistency, and morality, were put in charge of things. Imagine if others were subject to this person's whim. In 2081, that is reality. She says she would make a good Handicapper General, joking of course, and George replies, "You would." Yet in a way perhaps she did make the Handicapper General, since she is just the type of individual who would have supported even an immoral, illegal, illogical idea simply because at first hearing "it sounded like a good idea." Indeed it might sound like a good idea to someone knitting a fourth foot of sleeve to a sweater and to someone who thinks a stuttering newscaster should get a "big raise just for trying." To her husband who cannot move or think any longer, it probably sounded like a walking nightmare, but since he is now incapacitated, what he thought really does not matter anymore. Pleased be advised that Bergeron is a genius and an athlete, is under-handicapped, and is considered to be extremely dangerous. 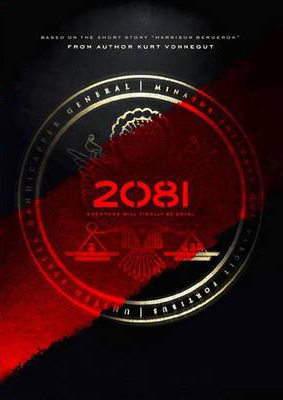 Of course given the world and rules of 2081, that statement is true. In a land of ordained egalitarianism Harrison Bergeron is not equal, he is great. Harrison's exceptional talents have made him an abomination and his unwillingness to be degraded has made him a fugitive. In his final scene, in which he outwits the Handicapper General, Bergeron goes out in a blaze of beauty and defiance. When his father sees the even on the television, he struggles against his device to remember when they came to take Harrison away and to put together that event with what he just saw on the television. Yet all he can do is feel sad. When he confesses this his wife, who missed the entire broadcast as she washed the dishes, she says, "You should forget sad things. I always do anyway." With that ending I wonder how we can expect Harrison's act to "change everything." Without getting bogged down in minutiae about the "mind device" I will simply say the ending is ambiguous. It is plausible both to infer those smart enough to rise up are too mentally incapacitated to do so or that enough people saw and understood the broadcast enough to react against it. While the ending changes what Harrison Bergeron's act might have accomplished, it certainly does not change what it stood for.